ARABESQUE by ORSITALIA: Italian contemporary baroque Tv cabinet made in solid wood lacquered and silvered. 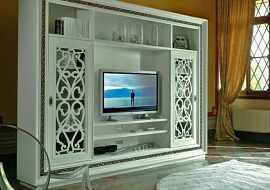 Arabesque by Orsitalia Tv cabinets consist of: tv wall unit, tall display cabinets and sideboard with doors and drawers, in french style. 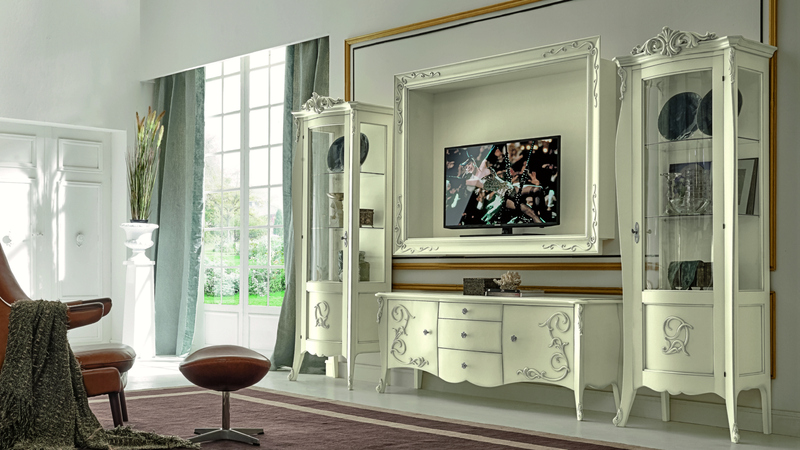 Arabesque luxury classic living room with lift tv stand is produced completely in Italy by Orsitalia. Arabesque Media unit combine the wall mounted TV together-with TV stands for storage and as a centre piece of contemporary baroque furniture for a luxury and elegant white living room. 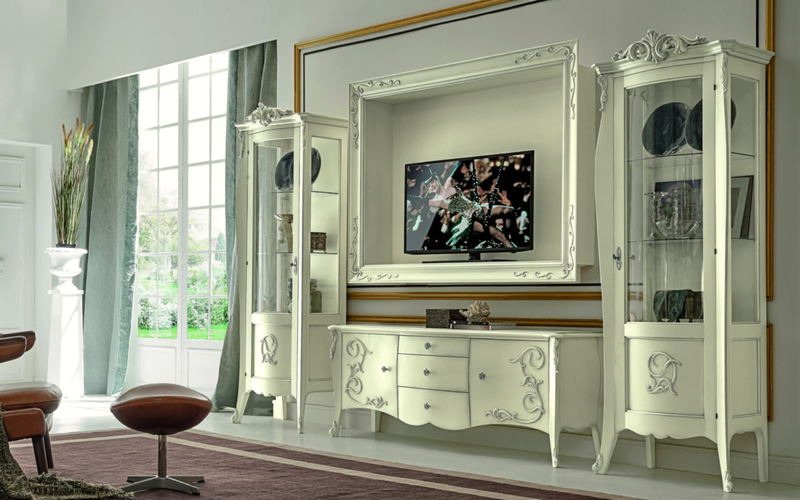 Arabesque glass display cabinets complete your TV media center. Orsitalia customize Arabesque, luxury entertainement for Tv, in wood color according to customer’s living project. Contact us we will support you in yr design projects. Tv wall unit: L. 144 x D. 30 x H. 110 cm. Tv stand: L. 166 x D. 44 x H. 68 cm. All ORISTALIA’s models are entirely made in Italy of solid wood. 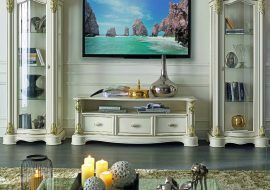 The lacquering and silvering is handmade and Orsitalia gives the possibility to customize Arabesque Tv Media center in color of wood matching to yr contemporary or classic living room. Arabesque display cabinets ara available with one door on right or left opening. ORSITALIA performs quality control tests in every phase of the production line, to always assure to our customers only the highest quality. 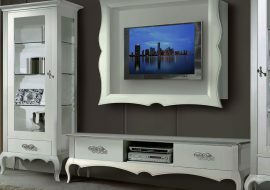 Avoid using solvents and abrasives on wooden Tv unit, use to clean only a humid with water soft cloth. Remember the wood is alive, so do not put into too damp or too dry rooms or outside. It is a product for Interior Designs. Do not use adhesive tape on gold or silver leaf.